Create a truly memorable business card or marketing mailer by having your next batch printed on made in the USA, eco-friendly, custom seed paper. Seed paper is exactly what it sounds like it is – paper with embedded seeds that sprout into beautiful wildflowers. Simply plant the paper in a pot with soil or directly in the ground and about a week or so later, wildflowers will sprout and your client or customer will be left with beautiful flowers to remind them of your message, company or brand. Factory Direct Promos features a stunning selection of 21 colors to choose from and a variety of soy-based ink colors so you can create something that captures your branding and message, but is different, exciting and green, both literally and figuratively. Even in this high tech age, business cards are still very common in the professional world. Still, traditionally they haven’t been very eco-friendly. Business cards take up space and people tend to collect them and when people eventually decide to part with their card collection they may toss them in the trash or maybe recycle them. Clearly recycling is the better of those two choices, but utilizing seed paper keeps the business cards out of the waste stream. 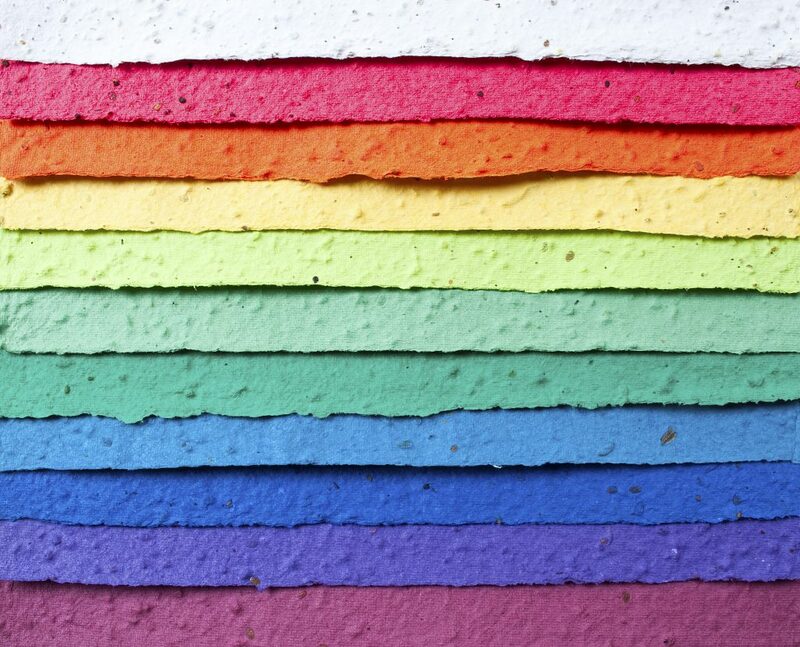 The paper used for seed paper is made from 100 percent post-industrial recycled paper and when planted in soil the paper will breakdown and compost and nurture the growing plant. Since the ink used is soy-based you can rest easy knowing that the entire piece is safe and biodegradable. Factory Direct Promos also has a selection of seed paper bookmarks that feature a space in which you can slip a die cut shape, so the seed paper shape can be planted and your client can plant or hold on to the handy bookmark. You can have your custom bookmark printed with your contact info and a branding message along with other relevant information. Of course the bookmarks are also recyclable so they can be properly disposed of or planted when necessary. Die cuts are great because it they are an opportunity to get creative – think about making a die cut shape that looks like your company logo or a shape that will tie into your unique marketing campaign. You can even get your employees involved in the creativity or just rely on the professional design department at Factory Direct Promos. 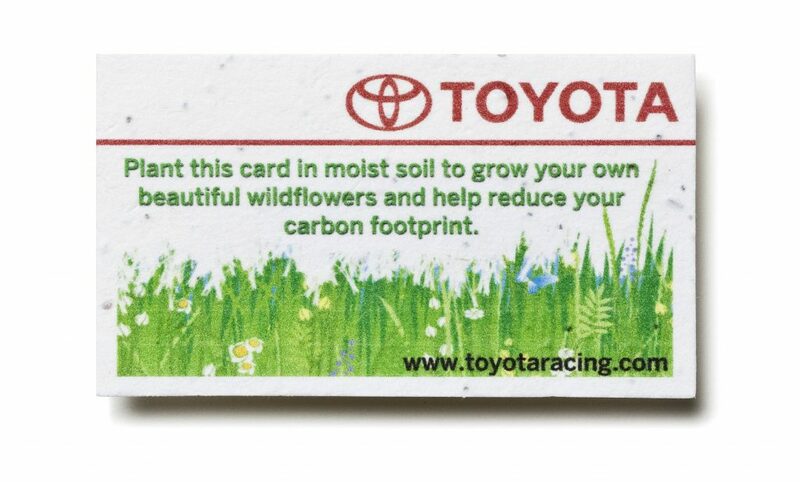 How Will Your Brand or Business Choose to Leave an Impression with Seed Paper? While seed paper makes memorable business cards and bookmarks, it really can be used for just about anything. Whether sending a marketing mailer, distributing a coupon code, or sending an invite to a new store opening or a grand re-opening, you can effectively use eco-friendly seed paper to spread your message. with die cut seed paper inserts that double as an ornament. Your recipients can plant the ornament when the holidays are over and remember the holidays while at the same time, going green. Seed paper also works nicely for sending out invitations to a birthday or anniversary party, or wedding. Use eco-friendly seed paper to get the details to your guests and give them some beautiful flowers to enjoy in the process. You can even purchase individual pieces of seed paper for printing jobs.